To God, Who giveth joy to my youth"
Readers of this column had inside access to the first High Masses celebrated by Phoenix, Arizona cathedral rector Fr. John Lankeit during his two-week visit to Detroit to learn the Tridentine Mass. On Saturday, January 26, Fr. 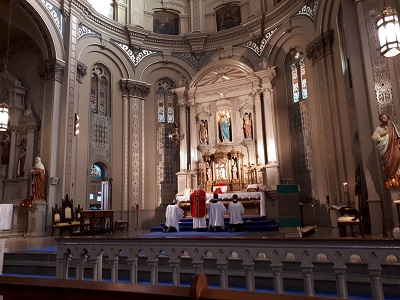 Lankeit celebrated a private High Mass at Old St. Mary’s Church (photo, top), and on Sunday, January 27, he offered his first public High Mass for the Oakland County Latin Mass Association at the Academy of the Sacred Heart Chapel (photo, bottom). He also attended his first Solemn High Mass with Deacon and Subdeacon with the St. Benedict Tridentine Community at St. Alphonsus Church on January 27. It is a moment of great grace for celebrant and faithful alike to be present for the first Traditional Masses of a priest. Prayer Pilgrimages director Michael Semaan has posted his list of bus tours to historic Catholic churches for 2019. Of immediate interest is the perennially popular tour of historic churches in Chicago. Usually offered during Christmas week, this year it will be held Monday-Wednesday, February 18-20. Stops will include the unforgettable St. Mary of the Angels Church and Our Lady of Sorrows Basilica. If there is sufficient interest, Tridentine Masses will be arranged during this tour, therefore it behooves those considering the trip to contact Michael as soon as possible. 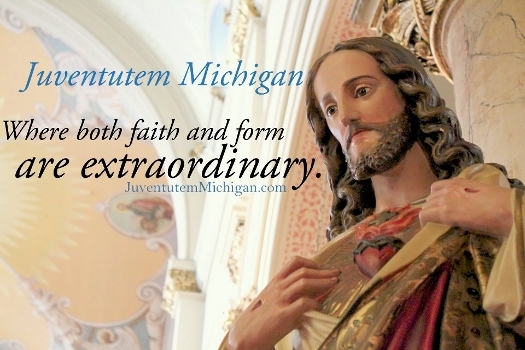 For information on the Chicago pilgrimage and other tours, visit www.prayerpilgrimages.com or call (248) 250-6005. 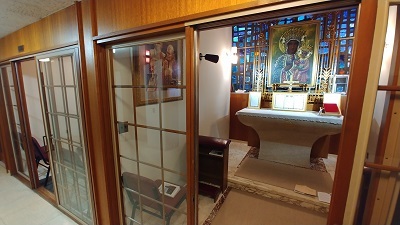 The August 26, 2018 edition of this column described the arcade of Side Altars in the main chapel at Detroit’s Sacred Heart Seminary, and that some of them are back in use as places where faculty offer the Traditional Mass. A similar arcade of Side Altars exists in the sacristy of the Shrine Chapel at Orchard Lake’s Ss. Cyril & Methodius Seminary. 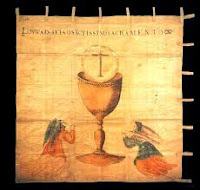 There are four altars where priests regularly offer Holy Mass ad oriéntem. One is used as an adoration chapel during the week. Orchard Lake Chancellor Fr. Miroslaw Krol and professor Fr. Louis Madey kindly offered the use of these altars as tutorial rooms over the past two weeks for Fr. Lankeit to learn the Traditional Mass. Next Sunday, February 10, Bishop Donald Hanchon will celebrate a Pontifical Low Mass and Confirmations in the Extraordinary Form for the Oakland County Latin Mass Association at the special location of Old St. Mary’s Church in Greektown at 10:00 AM. This will be the first Tridentine Mass to have been celebrated at the parish on a Sunday in almost 50 years. Coffee and donuts will follow the Mass in the main floor parish hall. This special Mass means there will be no OCLMA Mass at the Academy of the Sacred Heart that day. Mass will return to the Academy as usual the following Sunday, February 17 at 9:45 AM. Fr. Athanasius Fornwalt, FHS will be the guest celebrant at the OCLMA on the 17th.